I admit it, I dread the opening day of rockfish kill season like a vampire dreads a tossed salad. 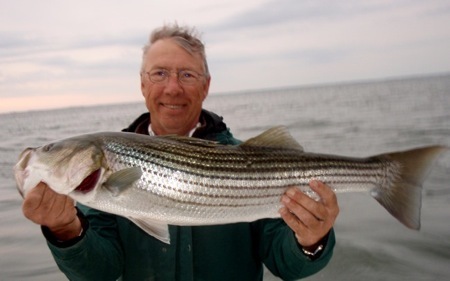 In my book, it’s the beginning of the end of good fishing on the Chesapeake Bay. With one stroke of the clock our tranquil miles of open-Bay solitude are overrun by frantic hoards of frenzied fishermen. The meat fleet is out in force on boats bristling with rods the size of rake handles and dozens of lines spread out hundreds of feet using planer board rigs. Lost somewhere in the melee is the concept of one-man-one-rod sportsmanship. To make matters worse, the Department of Natural Resources sets the opening of the kill season while there are still pre-spawn fish in the Bay. Big cows are routinely killed before they have a chance to spread the millions of eggs they are carrying. 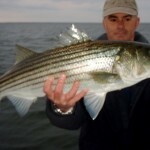 Maryland, we are sucking the life-blood out of the sport we love by killing our spawning fish. My brother Creig who is a fisheries biologist by training cautions me to look at the spawn as a process and not as an event. Fish spawn over a period of weeks or months, and not for just a few days. Fortunately, the warm weather we’ve had over the past couple of weeks has allowed some fish to complete the spawning process. 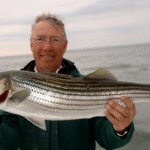 Keith Lockwood of Maryland DNR reports that fish began spawning in the Choptank, Nanticoke, and Potomac rivers two weeks ago. Nevertheless, the fishermen who are cleaning fish at the docks report many if not most of the females they’ve kept still contain e ggs. 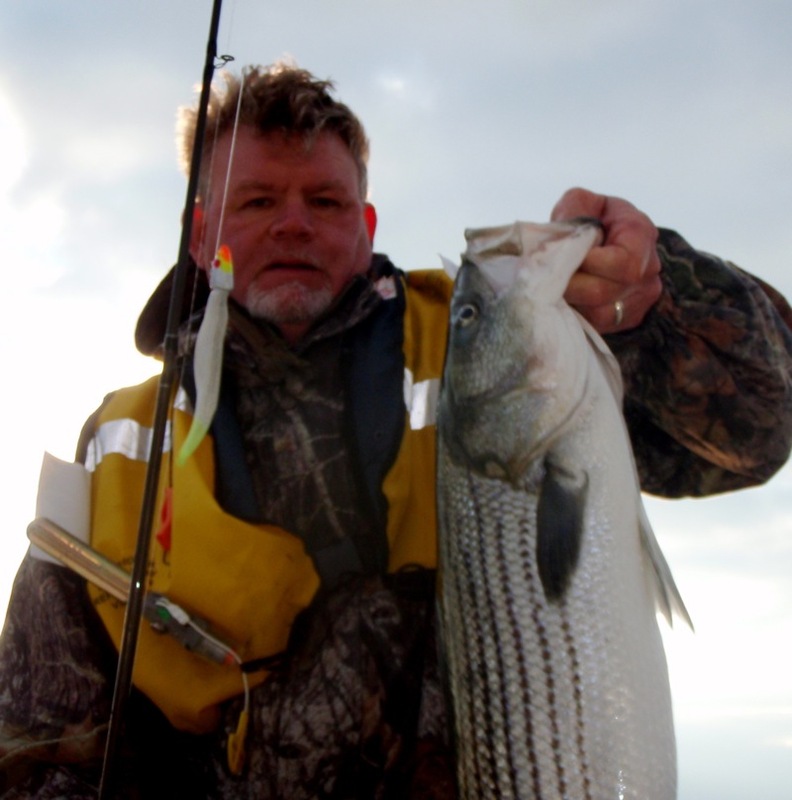 Most light tackle fishermen I know don’t do anything differently once the season opens. It just makes it harder to catch because we have to find fish where there is very little activity. I don’t want to sound preachy because I sometimes keep and eat the fish I catch. I just don’t think we should be killing the big pre-spawn rockfish. Take a photo and let them go. During the spawn, a picture is worth a thousand fish. Despite the madness, I got out for a few hours both days this weekend for light tackle catch and release. Saturday morning I fished with Tim and Mark in the Boatyard Bar & Grill catch and relase tournament as the only light-tackle boat in the event. I’ve caught several fish that were well over 40 inches this spring, so I thought our chances were good this year. We started early and landed our first fish before nautical twilight. If we had been keeping fish, we would’ve had our limit by 7:00 AM. We stopped fishing at 11:00 AM. Despite six fish over 30 inches, we couldn’t get one big enough to make the leader board. Foiled again! We’ll try again next year. Sunday evening I left Kent Narrows about 5:00 PM to check on some post-spawn locations nearby. Post spawn fishing is somewhat different from the way we target them in early spring. Pre-spawn stripers are on a mission. They’ll feed up on bait before they enter the rivers, but they’re more likely to be closer to the channel and not relating to any particular structure. After they spawn, they’ll hang around for a while and move toward shallower areas of the Bay. Birds will help you find post-spawn fish, but there aren’t nearly as many gulls in the Bay this time of year. The gannets have mostly migrated north now as well. The best strategy is to look for steep ledges and underwater humps where fish can chase bait into shallower water. 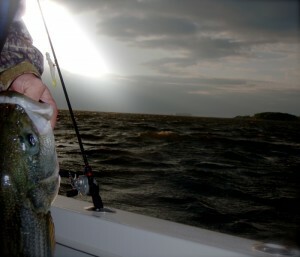 A steep ledge where there is lots of current is almost certain to hold fish in late April. 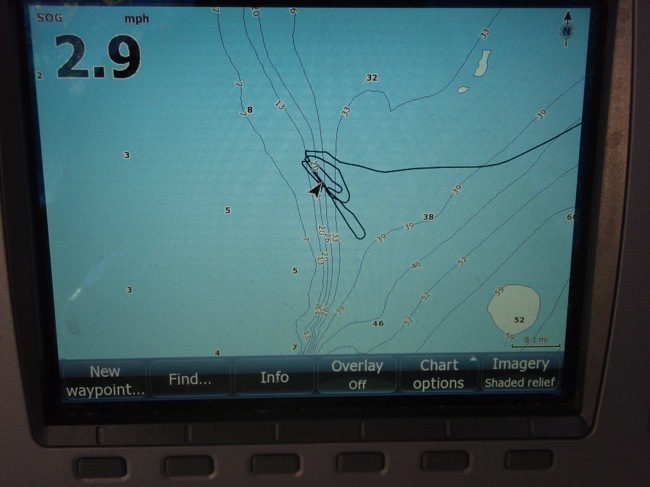 The GPS picture on the left shows the kind of underwater structure to look for. 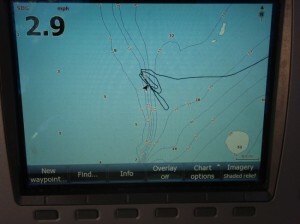 The darker line is the track of my boat and the lighter ones represent varying depths. When the contour lines on the chart come very close together, it means there is a steep change on the bottom. Rockfish like that because they can hide out in deeper water then quickly move up shallow to feed. I like it because I know the trollers won’t come near the skinny water, so I frequently have the fish all to myself. Look for bait on the fish finder, not fish. 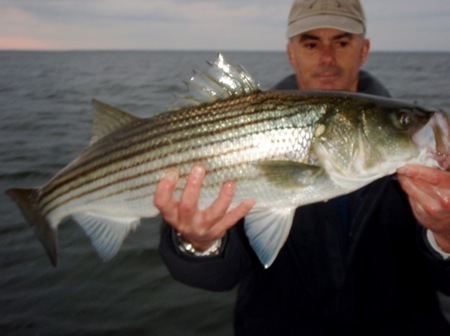 If the rockfish aren’t in big schools they’ll be easy to miss on sonar. If there’s bait fish on a ledge the fish won’t be far away, so start casting. This talk of shallow water reminds me that this is the time of year when the Susquehanna Flats usually turns on for top-water fishing as well. I’ll be reporting on the Flats a little later. I found fish at two post-spawn locations last night, one well off the main stem of the Bay and the other closer to the channel. My largest was 37 inchs. I had a strong incoming current and sustained 20 knot winds. It was very difficult to stay over the ledges, but I usually got several hits on every drift. I used 7 inch soft-plastic baits in either pearl or chartreuse on 1 ounce jig heads. I hotrodded all the lures by dipping the tails in orange or yellow garlic dye. Water temperatures are in the mid-50s. We have high skies and wind predicted for the first part of this week, so I expect casting to be somewhat slow but with cold fronts predicted to arrive by Wednesday, look for good fishing as the post-spawn pattern heats up. Shawn, please be preachy all you want! Removal of the pre-spawn cows by the “meat fleet” (thats great)is fundamentally wrong. Thanks for another great article. I’ve been saying the same thing for years, Ijust don’t get it. Like you said this is the sport we all love, and they are helping to kill it. Remember the 80’s. Thanks again for taking your time to write this great stuff!!! I got a lump in my throat just thinking about mounting that 40″ I got. Take 1 minute to look closely at the unique features of the individual fish you catch, and you’ll be hard pressed to kill it. Shawn you couldn’t be more right. I know I tease Uncle Phill all the time that we are going to switch over to trolling but there is no way we can do that. It’s a shame that DNR doesn’t restrict boats of only have out so many rods because some boats we see look like porcupines with all their rods sticking out. I really enjoy reading your articles and you get right to the point and I like that. Also thanks for the phone call last night I think Phill and I might head in that direction Saturday unless you find them at that other spot. Like you I keep a few fish, primarily because my wife loves Rockfish. But, because of the dramatic declines in the Rockfish populations that I have personally witnessed over the past 10 years, I have become much more protective of this very special species of fish. It’s especially shameful that Maryland allows and condones the killing of these large breeding fish at exactly the wrong time. Thanks for your great posts. 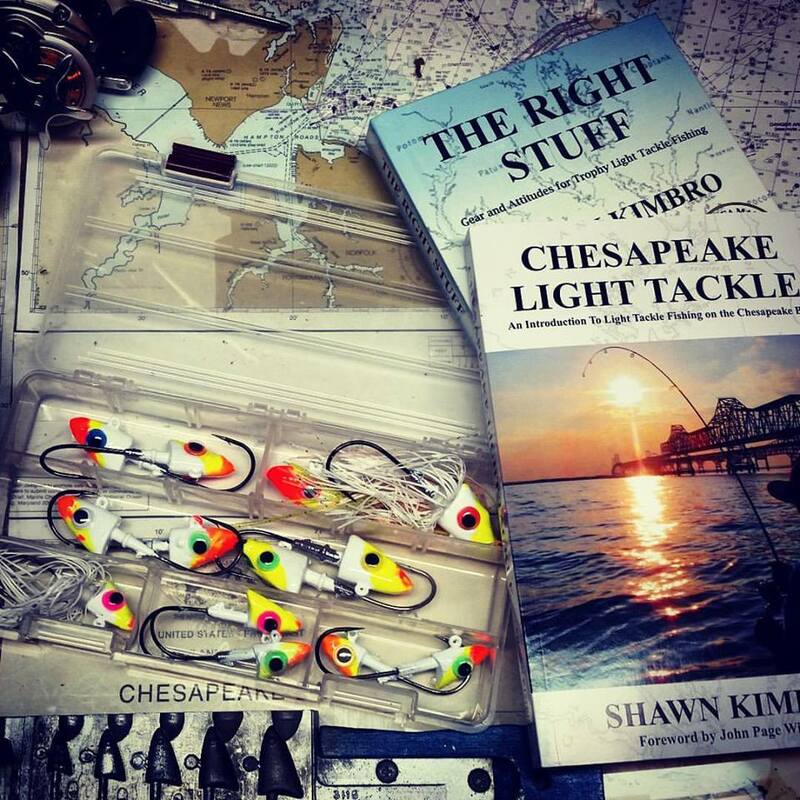 While you are a relative newcomer to the Chesapeake Bay you have certainly become one of the best light tackle anglers on the Bay. I especially appreciate your willingness to share. Too bad about the Boatyard Tourney. Good job for fishing it with light tackle though. We need more people out there like you with a strong fishing ethic. These fish don’t have a whole lot going for them, and we need to treat them like the important resource that they are. I couldn’t agree with you more.I too will keep a occasional fish and there is nothing wrong with that but we all should be selective so we can protect this fishery before its gone. Preachy is a good thing and Phill is right , the “meat fleet” is out in force and have totally different opinions on the season as you can understand…keep up the good work! Hadn’t checked your site in a while- Great job!!! Keep up the good work. It’s bookmarked. Nice. Hey, that’s my jacket. LOL. So when are you hitting the flats? I’ve heard good things. Thanks for a great day on the bay. I can’t believe you didn’t mention your boat won one of the most prestigious and sought after trophies. And where the hell is Timbo? Keep up the “good” fight against the pre-spawn catch and kill. Hundreds of decisions, conscious and unconscious will lead to you, one angler, one rod, one lure, one cast, looking for that next bite. 100% concentration, using your minds eye to watch the lure of choice, dancing and swimming as it moves through the water at varying depths to entice your quarry. All your senses on high alert waiting for that anticipated strike that will put together the last piece of this puzzle we call light tackle angling. Only to be repeated with every cast, can I build this puzzle again, quickly? There is something very satisfying about that. Every fish caught is a high that can not be explained to the non angler. Its not always winning that makes the day special and memorable. I had high hopes of catching fish over 40″ on light tackle too but in spite of not placing in the top this year it was a fun day on the water with you both and the party afterwards was a blast. Looking forward to trying again next year!